With Class going up a year and now showing as part of BBC1’s Monday night offering, there could well be a few new fans to welcome to the fold, so it’s timely to write a review of a tie-in novel that takes us back to the beginning. And so it is that Joyride sees latter-day Scooby Gang Charlie, Mateusz, April, Tanya, Ram and the TOTALLY FABULOUS MISS QUILL still at the tentatively-getting-to-know you stage of their relationship, still unsure how they should act around one another, and still unsure what to do when fellow classmates start behaving in ways that are both out of character and, ultimately, lethal. A normally studious, quiet girl manically drives a car into a shop window (and the language used to describe the aftermath of this is both breath-taking and sick-making). A likeable, responsible teenager kills his family for shits and giggles, and one of our protagonists wakes up to find himself inhabiting a middle-aged, overweight body (something I recognise only too well. Where did all those years go?!). This is probably not the best start to your day when you are the school’s equivalent of the high school jock (or would be if your leg hadn’t been cut off in episode one). 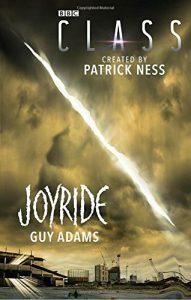 The main strength of Joyride is the premise around which the plot is based. It taps into the frustrations of the modern world and our seemingly never-ending search for escapism. It’s also nice to experiment with a story where, in another plot thread, humans are misusing lost alien technology for personal gain. This avoids the most obvious trope associated with Class’s USP; that of having to avert the threat of aliens that have just arrived through the rift that exists in Coal Hill School. Author Guy Adams doesn’t explore the thought-provoking concepts he introduces in much detail – but then, why should he? Like the title, this book is very much a joyride – it’s a work of fiction; a gorgeously grotesque story mixing sci-fi with horror for a young adult audience, so doesn’t need to kowtow to schools of psychology or philosophy. There is some content about the nature of greed, but little is actually revealed in any depth about the motivations or desires of joyriding ‘customers’. There isn’t much of an exploration into why people would be motivated to do what they do, or how they might feel afterwards either, and that’s fair enough. If I want that sort of thing, I’ll go read something academic written by someone with a stack of acronyms after their name. As someone with self-proclaimed attention deficit disorder, I’m not a fan of slow-paced literature. It’s why I have only ever reached page 32 of Lord of the Rings (despite 12 attempts), so if you like your stories to move at an almost relentless pace, this is for you. It’s this pace that ramps up the tension and creates a sense of continuous action, and in turn, it reflects the nature of the title, while short sentences make for punchy prose and help create an atmosphere of panicked tension.